On average there is one fire a day. Many of these fires are due to inadequate maintenance and cleaning. Built up Grease causes an environmental health hazard by providing a space for bacteria to grow. The filters fitted to canopies which are part of the kitchen grease extraction systems (kitchen extract ventilation systems) are not designed to remove all grease from the air. 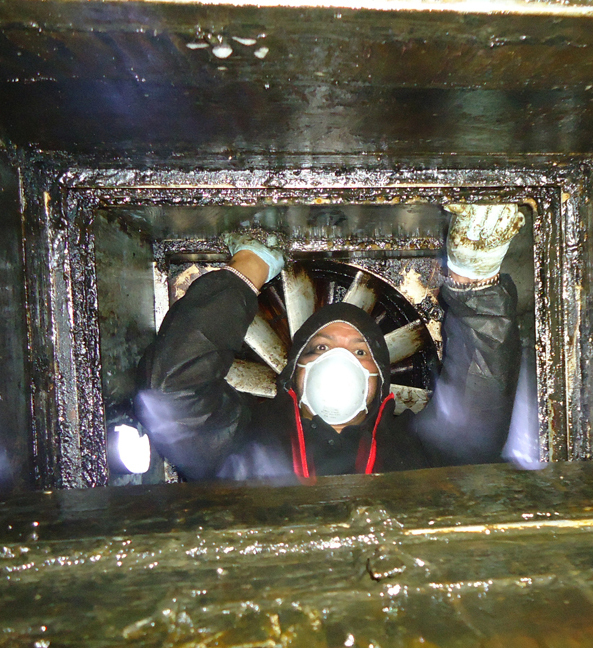 This means that inside the ducting the the sides are covered in built up grease. This is a major fire risk! You should never let grease build up as it will only help to cause a fire! Safety of commercial kitchens starts with a thorough cleaning protocol. It’s a good idea to get your kitchen regularly cleaned by experts to prevent these fire risks in the kitchen. Fires that begin in kitchen extraction systems ducting are very difficult to stop. Ductwork is often inaccessible, and fire may break out of the ductwork into other buildings. Damage is often serious and businesses are forced to close, it can take up to six months to recover from a fire and many businesses will never re-open. If business owners haven’t kept up regular maintenance on their kitchen extraction system they may also struggle to get their insurance policy to pay out in the event of a claim. Many insurance companies specifically request seeing a TR19 certificate to ensure that maintenance was done correctly. Here at 1st Commercial Clean we can offer you a professional service in TR19 cleaning for your kitchen. Our years of expertise will help your kitchen avoid fire risks and keep your business running. Call us now and speak to an engineer, and find out how we can help you on 0800 020 9132.